The road trip is a seasonal disorder for many of us, the desire for something different out there beyond the familiar street signs and neighborhoods. Jack Kerouac’s On The Road was published in the 1950s, during the Eisenhower years. His cross country trip became a literary classic of observations. A decade later in the rebellious sixties, Tom Wolfe went on the road to write of Ken Kesey’s Merry Pranksters and returned with a literary winner The Electric Kool-Aid Acid Test. The road trip hasn’t taken me coast to coast but the Ford now has over 162,000 miles in four years. I learned to drive with one hand and take a picture with the free hand, take short notes at the stop lights, and make quick, unplanned turns to follow something of interest. I used to worry about getting lost. Now I don’t really care. Getting lost means discovering something new. Last Monday, the lieutenant governor of Michigan announced flags would be flown half staff on Wednesday in honor of Army Staff Sgt. Matthew J. Leach, killed June 26 in Kandahar, Afghanistan. I was in Tawas in northern Michigan on Tuesday, where the Veterans Memorial Flag atop a 141 foot pole needs five people to lower it. This Veterans Memorial requires some effort to raise and lower, enough to make people stop and think of what it really means to have skin in the game. People whisper when they see a flag at half staff, embarrassed because they don’t know the soldier’s name. At a restaurant on the way home, a muscular military man came in and sat alone in a booth next to me. A few minutes later a small boy comes over and acknowledges him and sits across the room, in another booth. “You can sit with me,” the military man said to the boy, his son. They talked in low voices. The son held his father tight and never let go. His mother came in and sat in the booth across from them. She hardly said a word and murmured when the military man asked her something. “Stop touching my leg,” the father said to his son. The father was gone a long time, in some place distant and very tough. He had that demeanor and skin tone. There are muscles you get from working out and muscles you get from working hard. His muscles came from hard work. His son was intimidated. Everyone else in the restaurant was oblivious, too indulgent in their own comfort zone. In the mail box at home was the July newsletter from the Flushing school board. The front cover was about the 2012 Alumni Hall of Fame Honoree. His name is John Wayne Marcum, Navy SEAL, Senior Chief Petty Officer, two Silver Stars, Bronze Stars, a member of DEVGRU- SEAL Team Six. He was killed September 11, 2008. He had been on his twelfth deployment since 9/11. He refused several opportunities to save his skin, put on a clean shirt, and get assigned to a softer job. I know the exact moment the economic bubble was going to burst. I had gone in a hotel in Bloomfield Hills in 2008. A group of businessmen were in the hotel lobby. All of them were dressed in black shirts and sport coats, copying Lee Iacocca’s attire on the cover of his latest book Where Have All the Leaders Gone?. A woman sat in the lobby, unimpressed with the fake machismo. You would have thought from her expression that she was surrounded by artificial pink Christmas trees in July. After the market crash, Iacocca changed attire again and now reportedly copies the simple attire of Sergio Marchionne, CEO of Fiat and Chrysler. Everyone has skin in the game. They just might not realize the extent until it’s too late. The beauty of a road trip is that it takes you out of the comfort zone. The red van covered with protest graffiti in the Walmart parking lot looked like it had been through a road trip to hell and back. The irony was in the 99% scribble. The owner was still seeking a comfort zone. That he or she was in the majority. Never the minority, like the military man in the restaurant, the Navy SEAL on his twelfth deployment, or the Army Staff Sgt. coming home in a coffin covered in the American flag. This Walmart was in a pretty nice neighborhood. All the other vehicles in the parking lot were the kind of vehicles that would have kept the auto guys in hip black shirts and sport coats for a lifetime. Their machismo could have raised and lowered the Veterans Memorial Flag in Tawas Bay all by itself. 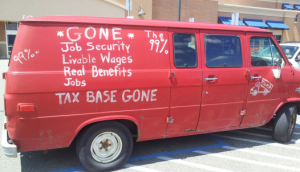 But this red van was in the one percent. Its skin was exposed in protest. Most ignored it as they went inside to shop, preoccupied with stocking their comfort zone. If history is a good guide, their turn will come, or already has, in the game of shirts and skins. The 141 foot high flag in Tawas Bay needs three people to raise and five to lower, to be exact. Two extra people are to make certain the flag doesn’t hit the ground. I don’t understand what’s so wrong about the American flag hitting the ground. It’s where rubber meets the road.